Mr. Funnel 5 Gallons Per Minute. Mr. Funnel is the leading portable fuel filter solution. Its proprietary technology filters out water, dirt and debris from a variety of types of fuels. Using Mr. Funnel technology helps prevent engine damage from contaminants. 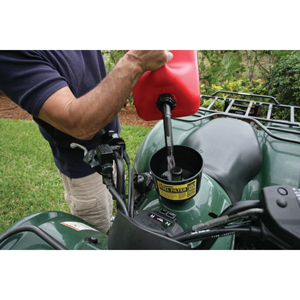 Their fuel filters are commonly used by: do-it-yourselfers for mowers and lawn & garden power equipment; contractors for generators; farmers for tractors and generators; offroad enthusiasts, boaters and pilots. What they all have in common is a need to protect their investments in equipment by making sure they have clean fuel going into their tanks.